You know what? I’m not even going to make fun of the Dot bottle. That would be like making fun of Michele Bachmann, or Bronies. It’s just too easy. I’ve never been much of a Marc Jacobs fan. I enjoy his Spongebob tattoo, but I hate his twee, shapeless clothes. Still, I think it’s fair to say that the Marc Jacobs perfume line is relatively decent. 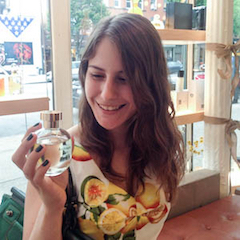 The original Marc Jacobs perfume was a perfectly nice aquatic gardenia. Quite a few of the Marc Jacobs Splashes have been very good. Daisy and Lola certainly weren’t masterpieces, but they weren’t straight-up bad, either. Dot is straight-up bad. Dot smells like sweet red fruit punch (most likely the “berry” flavor). It is indistinguishable from the legions of other sweet red fruit punch perfumes that have flooded the market recently (Taylor Swift Wonderstruck, Sarah Jessica Parker SJP NYC, Justin Bieber Girlfriend et al). I hate this genre of perfumes, but tweenage girls obviously feel differently. Dot will undoubtedly be a best seller, and I just can’t wait to start smelling it everywhere. ‹ PreviousThe 21st Birthday Giveaway! This review was brought to you by early-morning grumpiness, Portia! The splash bottles are great! I liked the Daisy bottle, too. This one is just over the top for me! Ha! Hard not to be grumpy when so many releases aimed at the youth market repeat the same Hawaiian-punch formula. And I’m not above making fun of the toy-like bottle. 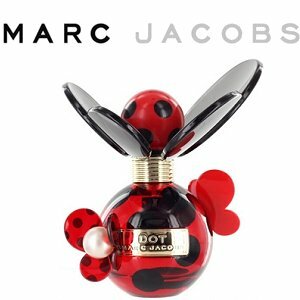 I joked on another blog that if Marc Jacobs keeps on this way (Lola being Daisy’s teenaged sister, Dot being their preteen little sis), his next fragrance will be for infants and come in a bottle shaped like a rattle. What will it smell like? Notes of milk, strained peaches, and cream of rice cereal? I’m Asian so I have a genetic weakness to any bottle that looks like it was inspired by Cute Overload 🙂 The bottle is super adorable to me, but I would be kind of embarrassed to own it at my age. I haven’t really been that impressed by anything MJ has put out. His first fragrance is the one I liked best, but Daisy and Lola and all the flankers just make me sad! Don’t you dare be embarrassed, baconbiscuit! This particular bottle doesn’t appeal to me, but I am completely unable to resist the cuteness of the Harajuku Lovers bottles. Maybe the MJ store? Weirdly enough I see it being sold at Sears! I would never have thought to look there! I do hope the ugly bug bottle is the end of this particular line for him. I liked his first one,and some of the splashes were good, not to mention great value. I have massive bottles of Fig and Basil and they are great in summer when you need to cool down – and I use them as room sprays as well! I never cared for this perfume but I hoped the bottle will be weird enough to wait for it to appear at some discounters… It is weird, I’ll give them that. But it looks soooo cheap in person. Disappointed. I still haven’t seen it in person, Undina! My Neiman’s only had a laboratory tester. Shame to hear the bottle looks cheap. Cheap AND weird is a bad combination! The bottle reminds me of something Italian. Moschino? Ok, I’ve got it now.. It’s like a ladybug light bulb. LOL! Now that you mention it, I do get that plug-in night light vibe!